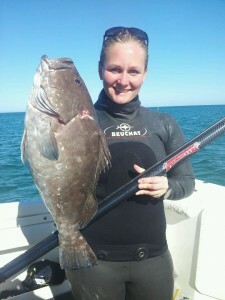 Last week I ventured to the other side of the country, the beautiful Exmouth of WA, to compete in the 2011 Australian Spearfishing Championships. The competition attracted some the top competitive divers from each State and as always I learned lots, laughed plenty and had an absolute blast. However, the actual competition heats proved extremely challenging and the three days were by far the toughest diving I have ever done. Held from the shore as a 6 hour swim-off competition, we were placed on a new patch of beach each day. Through bad visibility (sometimes as little as 2m and never more than a hazy 8m), rough conditions, barrelling waves, plenty of nasty sharks and huge 5km swims each day through the current and chop, the competition tested our physical and mental capabilities in the water. Nevertheless, it is always a fantastic feeling at the end, just knowing you did what most people would never do. For me, sticking it out paid off as I was awarded the title of Australian Ladies Spearfishing champion for the second year in a row! 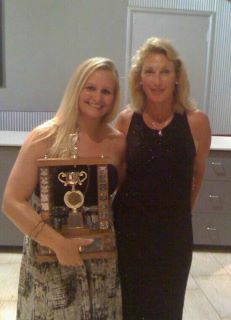 Being up against seven-time Australian Ladies Champion Mary-Anne Stacey, who you might recognise from the cover of the latest Spearfishing Downunder Magazine, I definitely didn’t expect to be taking the trophy home this year, and it was only by a very narrow amount that I managed to win. The men’s division was also a very narrow win, with eight-time Australian Opens Champion Ian Puckeridge defeating Dwayne Herbert of NZ by less than one fish to take home the title of Australian Spearfishing Champion once again. 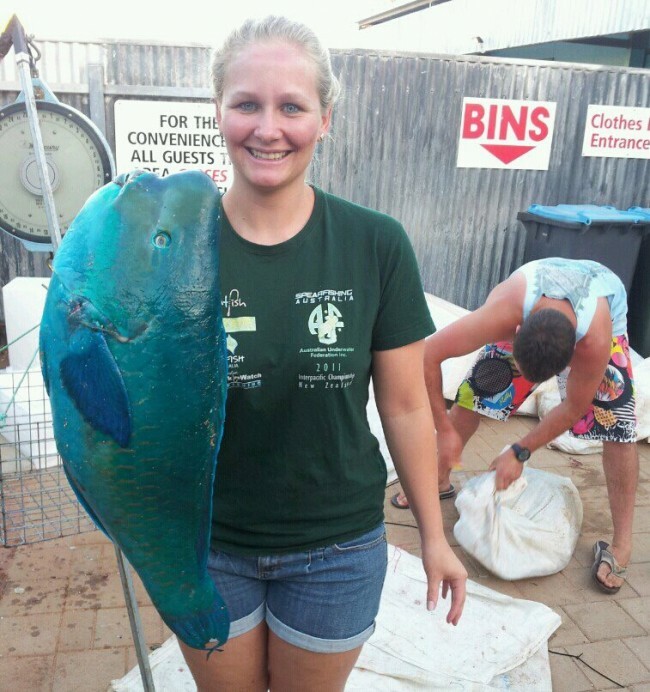 It is also worth noting that Ian’s son, 15 year old Aaron Puckeridge, took home 4th place overall and won the Junior Champion award and Biggest Fish award with a 38kg Giant Trevally – the biggest fish EVER landed in a National Competition! Massive thanks as always to Adreno for all of their help and support, and with the fantastic trip now at an end and having left the spearfishing paradise that is Exmouth, I can look forward to my next adventure coming up in March 2012 – the Interpacific Pairs Spearfishing Championships where I will be competing alongside Mary-Anne in HAWAII!